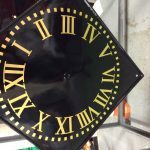 We have a range of analogue clock dials and hands templates available for manufacture and installation, or as supply only. Suitable for exterior and interior locations, they can be installed on virtually any wall surface, structure or frame. Sizes range from 460mm (1’6”) to 2,000mm (6’6”). Traditional style clock dial with integral raised numerals, minute markers and outer ring. Standard colours are black, blue and green with 23 1/2 carat gilding or white with black decoration. Custom colours, additional graphics and hand design options can be supplied. These are housings for wall-mounting dials or can be used for a 2 dial back-to-back for installation on a free-standing or projecting wall bracket. 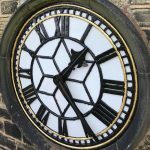 Our clock cases are suitable for interior or exterior locations. A range of inscribed dial templates are available in opal acrylic for backlighting, if required. Bespoke dials, commissioned designs and built from a wide range of materials. Our design team collaborate with architects and clients to create a clock which is unique and integral to your scheme. Sometimes referred to as open dials. With opal glazing for backlighting or as frames to reveal the wall. Star centre option for dials above 1m diameter. Tower clock hand designs are unique to each maker. Our classic H101 Smith of Derby hands continue this tradition. Our range includes other patterns, with specially commissioned designs or replicas of existing hands available. Anodised, reinforced and counterbalanced for long life and reliability. Download this document if you would like the complete Information on clock dials and cases, including Roman Convex, Skeleton, Inscribed, Cases, Hands and Design Options.